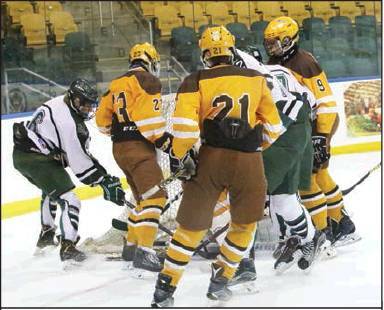 The Lancers defeated the West Essex Knights, 4-2, on Saturday, February 2, at the Codey Arena. The Lancers then lost to the Watchung Hills Warriors, 5-2 in an afternoon match-up on Monday, February 4. Above, Lancers Michael Mumm, #6; Dylan Foley, #2, and Cade Prendergast, #17, converge on the goal for a possible rebound against Watchung Hills. 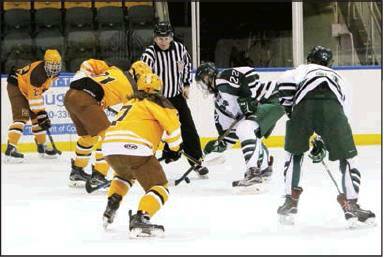 Below, Lancer center Jacob Fuhrman, #22, wins the face-off against Watchung Hills. Awaiting the puck is Lancer Matthew McLaughlin, #11.